All precision vernier periphery tapes manufactured by Pi Tape are individually serial numbered. Prior to despatch, they are calibrated under 2.25 kg (5 pound) tension at 20°C (68°F). 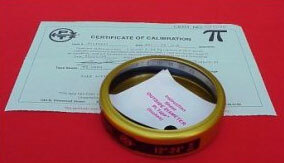 A Certificate of Calibration is issued free of charge, with every new tape using its serial number as reference. The need for a Certificate of Calibration arises from the tolerance on all tapes in the placement of the 'Vernier Section' relative to the 'Gauge Member' along the length of the tape. Since this tolerance (error) is the same throughout the whole length of our tapes only one point of calibration is required for each tape. Tape reads: 599.98 mm over 600.00 mm Master Gauge. In this case add 0.02 mm to ALL readings to give the correct diameter. Tape reads: 600.01 mm over 600.00 mm Master Gauge. Then subtract 0.01 mm from ALL readings to give the correct diameter. If the Certificate of Calibration is lost a copy of the Original Certificate can be supplied from our computer records if the Serial Number of the tape is given. The cost of a replacement Certificate of Calibration, is £30.00 or E 50.00 each.